At the end of the third movie of the Rupturian saga, “The Magnetic Being’s End”, via the Rupturian Intergalactic Network (RIN), we learn that the Rupturians have discovered eight planets that can sustain Human life, in the Ptolomeo Dual Spiral of the Virgo Cluster of galaxies, 86 million light years away from the nucleus of the Local Group cluster (Milky Way, Andromeda and Triangulum galaxies). The colonies in the Ptolomeo Dual Spiral have the colony New Earth as the starting point. Going up and around in the right direction we have the colonies Thebes, Teotihuacán, Nazareth, Angkor Wat, Pompeii, Shangri-La and Utopia. These names were chosen because they represent important civilizations in the history of mankind. New Earth—The planet New Earth is the first colony in The Spiral. In New Earth, there are replicas of the main cities on Earth: Little New York, Little Paris, Little Moscow, Little Tokyo, Little Cairo, Little Calcutta, Little Rio de Janeiro, Little Mexico, etc. All teleportation from Earth to The Spiral (and from The Spiral to Earth) makes an obligatory stop here, since it is the spiral’s firewall for customs, security, and health. All living beings—people, flora, and fauna in general—and all material and electromagnetic objects entering and exiting The Spiral are subject to scrutiny at the molecular level, including a check for conditions that may affect the microbiological eco systems of the planets when entering, and of the Earth when leaving. Thebes—Greek word that means “city of the doors.” The Greeks gave this name to one of the most important cities in ancient Egypt because it had huge doors that communicated with the gods. The Egyptian name was Apet. The planet Thebes is the gate door to the internal part of The Spiral. All teleportation activities to the internal part of The Spiral are initiated here. Teotihuacán—Capital city of the Toltecs, in Mexico. Teotihuacán means the “place where the gods are born.” Quetzalcoatl, the feathered serpent, was born in Teotihuacán. He gave birth to the fifth cycle of man: The Fifth Sun. Quetzalcoatl represents the cyclical characteristics of man’s evolution. Now we are in the sixth cycle, or Sixth Sun, which began with the appearance of the Virgin of Guadalupe. In the planet Teotihuacán, replicas were made of the ritual sites of Tikal, Tenochtitlán, and Teotihuacán. Tepeu and Xquic made a copy of the waves in the parallel dimension on Earth for these ritual sites and brought them to this planet so that, in the future, they would be able to visit events from the past that occurred at these sites. Nazareth—Place where Jesus was born. It represents all religions in their purest form. The planet Nazareth is at the heart of The Spiral. It has several suns, moons, and large asteroids shining by reflection, creating a uniform spring weather temperature at all times. There are no nights. Cities are built under magnetic shields that simulate night every twelve hours. Beneath the shields, it is practically like being on Earth, with the time divided in hours, days, nights, weeks, months, and years; but outside there is no change of temperature and there is always a uniform day light. Nazareth is also called the “Silicon Planet” in reminiscence of the “Silicon Valley” of California. Nazareth is the place to go for scientific research in mathematics, physics, communications, and information technologies. Mathematics advances exponentially, associating numbers and symbols; it becomes the language of communication for anticipated non-human beings that are suspected to exist in yet unknown areas of the universe. Angkor Wat—In northern Cambodia, treasure of the Khmer empire from A.D. 802 to A.D. 1431. The temple of Angkor Wat is the largest religious monument in the world. This planet is reserved for people with tendencies, awareness, and needs of a spiritual nature. Living in Angkor Wat is a privilege given only to people of merit, of all races and walks of life. Angkor Wat is Akhenaton’s city dedicated to god, Akhetaton, at a planet level. All religions are allowed. In the planet Angkor Wat, there are research programs dedicated to the understanding of our mystical mind. What is it that poses on us human beings a spiritual quest? Pompeii—Roman city on the bay of Naples, destroyed by the eruption of Mount Vesuvius in A.D. 79. It has been excavated for more than 250 years. It is called the eternal city. In the colony Pompeii, the main interest is to optimize man’s biological evolution. There are all sorts of facilities and research activities dedicated to molecular biology, including cloning, soul transplantation and transfiguration, personal stem cell banks, rejuvenating programs, and the like. The Children of God, instead of in all planets as originally planned, are incubated and fine-tuned—biologically speaking—in Pompeii. Shangri-La—Represents eternal youth. Shangrila, or Land of the Thunder Dragon, is in Bhutan in the Himalayan range. It is a paradise, with unspoiled ancient cultures and traditions. This planet is reserved for people over 100 years old. At the age of 120, people either die by disintegration or are transfigured into Human Soulstrings. Utopia—This colony is dedicated only to the Children of God. Utopia is an archipelago of 1,000 small planets half the size of the Moon, interconnected via Inter Galactic Teleportation Tunnels. Only religions based on new paths to spirituality are allowed. In the old Greece, during the golden times of Aristotle, Socrates and Plato, the latter used to present his philosophical concepts via dialogues… well, I am going to do the same. I am going to make an interview to myself as a way to explain the differences between the movie Rupturian –Extinction on Earth” and the novel “Last Call from Earth –Stage I, Biological Survival”, both of them created under the Rupturian concept. Doing this I’ll cover the subject of this blog “About the Rupturian script”. Under the Rupturian concepts, I wrote the first novel of the trilogy “Last call from Earth”, which deals with the biological survival of the Human race before a major catastrophic event. Q. I understand you prepared a script for Rupturian –Extinction on Earth. How different is it from the novel Last call from Earth? A. The script contains the same basic elements and concepts, but presented and developed in a different way, and in a different order. That’s the beauty of the Rupturian concept; that is, several stories may be written about it. Q. Could you give an example of a different way? A. 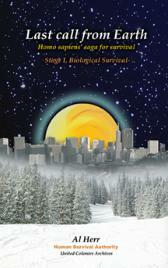 The basic event in the story is that humanity faces imminent extinction. In the book that is caused by a collision against our universe of another universe; due to the collision there is a rupture through which strings escape (strings are the basic components of everything that exist in our universe), and consequently, our atmosphere is affected…. This is a concept very difficult to communicate and develop in a movie. 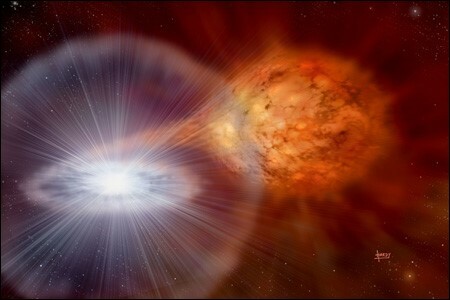 The script was changed so that now what we have is a supernova; that is, a major explosion (or implosion) of a star. In the history of our planet, 440 million years ago, a supernova almost finished life on Earth. A supernova makes the script more realistic. Q. And also more graphical and dramatic; I can see that. Do you still make it happen on December 21, 2012? A. No. It happens in the immediate future, but not a specific date. This makes the story more permanent. Q. Could you give an example of a change in the order of the story? A. In the book, the story starts in the XXIII century, 280 years from now, and we look back to what has happened up until that moment; in the movie, the story starts at the present time and moves forward. In the book, the people in the colonies that we establish in other planets get sick with CRDS (Circadian Rhythm Degeneration Syndrome). The disease is caused by a disruption in the normal functioning of the DNA, caused by not teleporting microorganisms that the human body needs to be normal. In the movie, the people that would remain on Earth after the supernova are the ones that would get sick with CRDS. While the radiation of an atomic bomb affects living organisms immediately, the radiation from a supernova affects the DNA resulting in cancer, dementia, and physical malformations. With this change, the script becomes more realistic… but in the end, during the last minutes of the movie, that doesn’t happen because we are saved using advanced Rupturian technology to create a gas cloud diffuser that filters out the life damaging particles of a supernova. Q. The overall concept of the Rupturians remains the same? A. Yes. That’s a key concept. Without the advanced Rupturian technology and their vision of reality the Rupturian stories don’t exist. Q. Looking at things in perspective, how do you see the novel versus the movie? A. I would say the novel is the classic version, the way I thought about it for the first time, without putting any constraints to my imagination. And the script is the result of many, many revisions of all sorts to make it more realistic; it is the result of a team effort. The final script is the result of several revisions made by a team of professional writers that include Brad Schreiber, Peter Mellencamp (STAR TREK) , Paul Young (THE LORD OF THE RINGS) and Paul Guay. Q. Which one do you prefer? A. Both; the first one for sentimental reasons. I still remember when I thought about it for the first time. I was in New York in a very cold winter, the boiler was broken, and I had to wear my coat in bed in order to sleep. I had just read a couple of books about the fabric of the universe and the strings theory, in my mind I created a minor big bang explosion and the Last Call from Earth started to exist. In practical terms I prefer the script, since it is the result of thinking and rethinking the same concepts, by several people, over and over again, until the story became simpler, more realistic, and with emphasis in the most important aspects. Q. Still thinking about a trilogy? A. Yes, but in Rupturian the story is different. In Rupturian I, we are going to be hit by a supernova that will finish life on Earth, but we are saved using the advanced technology of the Rupturians. In Rupturian II, with the advanced technology of the Ruprurians we start to explore vast areas of the universe, but with such an advanced technology we come close to destroying ourselves, like the Rupturians did. In Rupturian III, via recordings in the Rupturian Intergalactic Network (RIN), we will see how and why the Rupturians annihilated themselves; all of them committed a collective suicide, destroying even their planets… Only one Rupturian remained, because he was travelling in a parallel dimension, and he is the one that appears in the first movie of the trilogy. And then, if we get pictures from the new James Web Telescope, currently in construction, we will have a fourth movie: “The Birth of the Universe” where we will see how our universe started in the Big Bang, we will discover the origin of life, and we will do soul transplantation from one body to another. Q. Why is that better? A. Soul transplantation into another body has religious connotations; one of the most critical issues being: What happens to the soul that was in the recipient body before? The concept of teleportation, on the other hand, is normally accepted without moral, ethical or religious concerns. So I rather leave Soul transplantation to the very end. The business concept is to produce the first film of the trilogy with the least possible budget, $6M, and then increase progressively in complexity as far as the setup of the scenes is concern, with larger budgets. The Rupturian stories will be structured in episodes, to facilitate the programming of TV miniseries. The gamma-ray burst of the WR104 supernova is about to hit the Earth. We are on the verge of extinction. Our only salvation is using Rupturian technology, a highly advanced alien civilization. In CGI, the expensive scenes are those that have human interaction with a CGI background. In Rupturian I -Extinction on Earth most of the CGI scenes occur in the outer space with physical objects created with the computer; consequently, the budget is only $6M. With the advanced technology of the Rupturians we will explore vast areas of the universe; that is, we will reach into what is known as the “dark universe”, but with such an advanced technology we will also come close to destroying ourselves, like the Rupturians did. This requires more expensive scenes, so that Rupturian II –Our own annihilation will have a larger budget. Via records of the Rupturian Intergalactic Network (RIN) –similar to our Internet but of a Local Galaxies (Milky Way, Andromeda and Triangulum) scale, we will see how and why the Rupturians destroyed themselves. With the advanced technology of the Rupturians, we will see how the universe was created in the Big Bang explosion. We will discover the origin of life, and we will be able to do soul transplantation. According to the Big Bang model, the universe expanded from an extremely dense and hot state and continues to expand today. According to the String Theory all the components of the universe already existed in that “point” that exploded during the Big Bang, is just that it is expanding. According to the Rupturians, as presented in the book Rupturian Vision of Reality, that is impossible. What happens is that “strings”, the basic component of everything that exists in the Dimension of Being, are constantly being brought into existences from the Dimension on Nothingness (Not-Being); that is, there is constant generation of the components that make up the fabric of the universe; there is a constant flow of strings from Not-Being into being. The Rupturian movie scripts will be converted to short graphical novels, and will be promoted along with the theatrical movie releases. Additionally, several other stories will be developed under the general Rupturian concepts. Go to Google and do a search on “Rupturian”; you will get thousands of results. According to the Rupturians there are three types of realities: Natural, human and personal. Dànshì wǒ de xiànshí, wǒ, wǒ shì shuí, wǒ míngbáile yīqiè. Wǒ zuì zhēnguì de chuàngzào shén. Shìjiè de cúnzài duì wǒ lái shuō. Tā, yǔzhòu chuán jiāng yǔ wǒ bēngkuì. Riariti no genjitsu Sukunakutomo hitori no otoko wa ikinakereba narimasen Sono ningen no genjitsudesu. Tsūjō no genjitsu no tame ni Watashi wa taikai no itteki-mimandesu… Chirichiri-miman… Shikashi, watashi no genjitsu wa, watashi wa watashi ga dareda ka, watashi wa subete o rikai shite imasu. Watashi wa kami no mottomo kichōna sōzōdesu. Sekai ga soko ni watashi no tame ni sonzai suru. Watashi ga shinu toki, Watashi wa, shi no fukai umi de oyogu jiki Sore wa, uchū no fune wa watashitoisshoni hōkai suru. 하지만 내 현실은 내가 누군지, 나는 모든 것을 이해합니다. 나는 하나님의 가장 소중한 창조물입니다. 그것은 우주의 배는 나와 함께 붕괴 할 것이다. hajiman nae hyeonsil-eun naega nugunji , naneun modeun geos-eul ihaehabnida. naneun hananim ui gajang sojunghan changjomul ibnida. sesang i naleul wihae jonjaehabnida. geugeos-eun ujuui baeneun nawa hamkke bung-goe hal geos-ida. Ngunit ang aking mga katotohanan ako kung sino ako, nauunawaan ko ang lahat. Ako ang pinaka-mahalagang paglikha ng Diyos. Ang mundo ay umiiral para sa akin doon. Ito, ang bangka ng uniberso ay tiklupin sa akin. The Rupturians were a highly advanced civilization that flourished in a three suns system in the Triangulum Galaxy (one of the three large galaxies of the so called “Local Group” –just to imply the size of the universe- that also includes our Milky Way and the Andromeda Galaxy. They passed through the changes of evolution for a period of over 20 million years. (as a way of comparison, we human beings have, at most, 8 million years of evolution). At one moment, however, they destroyed themselves, not only as physical beings, but also the planets that they inhabited. Why? Well, to know that you will have to see the third movie of the Rupturian trilogy (I: Extinction on Earth, II: Our own annihilation, III: The Edge of our Universe). What I can tell you in anticipation is that it has to do with life problems of a microbiological nature that disrupts the normal functioning of the DNA. Anyway, only one of the Rupturians survived; he was in a separate dimension when all the components of their normal reality were completely destroyed, not leaving not even a trace of their existence. Only one Rupturian survived, and their RIN: Rupturian Intergalactic Network; in concept similar to our internet, as a network for knowledge and communications, but of a larger scale, with an access scope that includes the Local Group of galaxies. Well, the last of the Rupturian wrote some notes about their Vision of Reality. Keep in mind that they knew the ins and outs of our universe, its origin and composition. In this section of my blog, I am going to publish some of their thoughts. I am organizing the production of the first movie of the Rupturian trilogy. On October 19, 2013, that is, the following Saturday, I am going to start a crowd funding campaign at Indiegogo. What I would like to do now is to invite you to become a member of the Rupturian Producers Group, going to Facebook and Linkedin to do so, or to the page “Subscribe to our mailing list” of www.rupturian.com. I also invite you to read “An invitation from Al Herrera” on the Rupturian website. In French, German, Portuguese and Italian. The Rupturians like to present their concepts in poetic form. I have already presented in my blog the following poem, but now I am going to present it in seven languages: English, Spanish, Russian, French, German, Portuguese and Italian. In order not to make the blog too long, yesterday I presented the first three languages, and today, the last four. pour que la réalité humaine existe. Mais en ma réalité personnelle je suis qui je suis, je comprends tout. Je suis la création la plus précieuse de Dieu. Le monde existe pour que j’existe. Elle, la barque de l’univers s’ecroulera avec moi. damit die menschliche Wirklichkeit existierent. Aber in meiner persönlichen Wirklichkeit bin ich, was ich bin: ganz umgebend. Ich bin kostbarste Kreation des Gottes. Die Welt besteht, damit ich bestehe. sinkt sie, das Schiff des Universums mit mir. para que a realidade humana exista. Mas em minha realidade pessoal eu sou o que sou: compreendo tudo. Eu sou a criação mais preciosa do Deus. O mundo existe para que eu exista. affinchè la Realtà Umana esista. Ma nella mia Realtà Personale sono ciò che è: comprendo tutto. Sono creazione più preziosa del Dio. Il mondo esiste affinchè io esista. Ella, la nave dell’universo si affonderà con me. The Rupturians liked to present their concepts in poetic form. I have already presented in my blog the following poem, but now I am going to present it in seven languages: English, Spanish, Russian, French, German, Portuguese and Italian. In order not to make the blog too long I’ll present three languages today, and four tomorrow. According to the Rupturians there are three types of realitties: Natural, human and personal. for the Human Reality to exist. But in my Personal Reality I am what I am: all encompassing. I am God’s most precious creation. The world exists for me to exist. She, the ship of the universe, will sink with me. para que la Realidad Humana exista. Pero en mi Realidad Personal yo soy lo que soy: lo abarco todo. Soy la creación más preciosa de Dios. El mundo existe para que yo exista. Ella, la nave del universo, se hundirá conmigo. чтобы Человеческая Реальность могла существовать. Все, заключенное во мне самом. Я – драгоценнейшее Божье создание. Мир существует, чтобы существовал я.
Она, эта ладья Вселенной, погрузится туда вместе со мной…. Continuing with my previous blogs about the Nature, Origin, and Evolution of the Soul, where I included “The Soul in the Subjacent Layer of Reality”, “The Soul in the Physical Layer of Reality”, “The Soul in the Biological Layer of Realilty”, “The Soul in the Emotional Layer of Reality” and “The Soul in the Mental Layer of Reality”. In the Spiritual Layer of Reality the soul is getting ready to reach its final destination. It has two levels: Humane and Divine. In the Humane level, the soul concatenates or enters into communion with other souls that have reached the Spiritual Layer. In the Divine level, it initiates contact with God. In the Spiritual Layer of Reality the soul elevates to higher levels of consciousness. In the Divine Layer of reality, the soul reaches its final destination: it enters in communion with God. It is again, as in the beginning, a sea of spiritual energy, a collective soul, but of a Divine nature. In the Divine Layer of Reality the soul elevates to highest level of cosmic consciousness. Eternal is without beginning and without end. Temporal is with beginning and with end. A-temporal is not measured in time. The soul has a beginning, but when it reaches the Divine it gets into a stage where time does not exist. It is temporal in the first six stages and becomes a-temporal in the last. The spirit is the spark of life. This spark is the same from the moment Rupturian soulstrings jump-started life on Earth, in a bank of RNA, 3.5 billion years ago; and is the same in all living organisms. The soul on the other hand, changes with evolution: becomes more complex, richer and spiritual. A Lyon has a sense of self-identity: he has a soul; but not as complex and richer as ours. We ourselves have now a richer soul than the one we had 6 million years ago; but poorer than the one we will have 6 million years from now. The soul as the result of a brain process appeared in the latest stages of evolution. It doesn’t “descend” from any place into the body. It is already given in the nature, in the chemistry, in the functioning, in the “mechanisms” of the body. Each unique soul is created at the time of conception, when the spermatozoid and oocyte integrate and create the zygote. As the newborn grows in life, his / her self-consciousness, self-identity, capacity for love and strength of will develops. When the body dies, the processes that give existence to the soul stop. A soul may be transplanted into another body not only by transplanting its physical- biological components (actually transplanting the brain), but also the electromagnetic recordings of the brain. These recordings may be saved in the Spiritual Layer of the parallel dimension of reality, to be transplanted in the future. At our present state of evolution, our soul has risen to individual consciousness. As our evolution continues, new components will be added to the brain that will progressively allow us integrated, collective consciousness, until we reach the Divine Layer. A meeting of our integrated souls with the divine cosmic consciousness: that is our final destination. I am organizing the production of the first movie of the Rupturian trilogy. On October 19, 2013, that is, the following Saturday, I am going to start a crowd funding campaign at Indiegogo. What I would like to do now is to invite you to become a member of the Rupturian Producers Group, going to Facebook to do so, or to the page “Subscribe to our mailing list” of www.rupturian.com. I also invite you to read “An invitation from Al Herrera” on the Rupturian website.